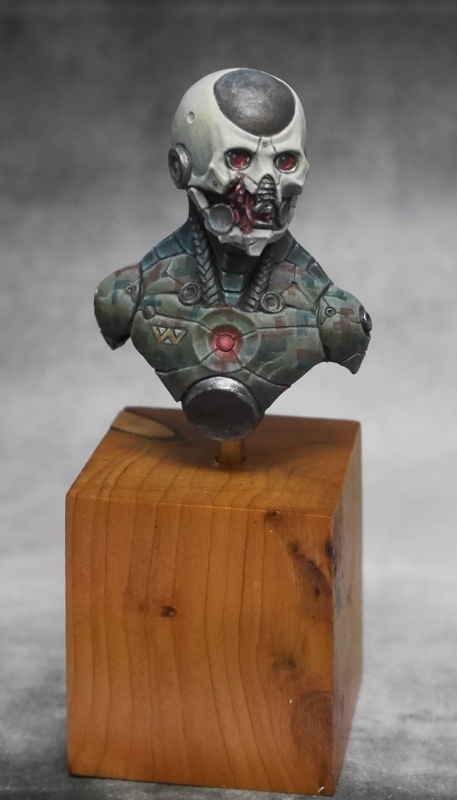 The cyborg veteran is now complete, with pics over on Putty and Paint. I’m really happy with how he came out in the end. The predicted fix on the skull, touching up the reflection spots on the greenish NMM-ish parts and a marking did what I wanted them to. He’ll be heading over to Scale Model Challenge at the end of next week, so if you’re heading there yourself, you might be able to find him to check him out. What you might notice is that I didn’t go with a squad marking or designation in the end; instead, I went with the Weyland-Yutani logo. For those somehow not in the know, the Weyland-Yutani Corporation is the company behind all of the nefarious plots in the Alien films. It’s obviously pretty well known among sci-fi fans, which lets me provide some narrative to the piece without actually doing a whole lot myself. This is a technique that’s been used in literature and the visual arts for centuries, and especially with the rise of cubism and later modernist movements. In cubism, in particular, it took on a pretty interesting position. If you remember your art history, you might recall that the cubists moved into collage and montage in the later stages, which is where they really developed what they called ‘ready-mades’. This is where you take something that is known and place it into a new context; it brings with it all of the meaning and connotation it had in its original context and lays this over its new context. It can be pretty interesting, and it can be quite confrontational. Probably the most famous use of a ready-made is Marcel Duchamp’s ‘Fountain’, which is just a urinal turned upside-down. Obviously, that’s an extreme example of a ready-made, and you can just use something simpler or less… absurd. In painting miniatures, things like this can be really useful, and we often do them without really thinking about it – you might use a sign pointing the way to Raccoon City, for instance, or a poster advertising the new wonder drug Ubik, and so on. You’re attempting to bring an already fully formed idea into your work. You can even do it just with the name of a piece. One of my more recent pieces, for instance, I call Lemarchand Configuration no. IV. To most people, I imagine, that’s just kind of an odd name that suggests something, but you’re not sure what. To a fan of the Hellraiser universe, however, it’s much more significant – it’s one of the Lament Configurations that opens portals to other… realms, so the whole piece takes on (I hope) a new meaning. Anyway, that’s just a bit of insight into one of the many ways I try to bring narrative into my works. In other news, I’ve been working on the Roman Signifer again. I’ve repainted his face, painted all the other stuff around it, and assembled him. By god, he’s a weighty chunk of metal. I’m really happy with the face having been reworked (although I still had to paint around the cheek guards – it turns out my superglue was just a little too good, and removing them to get at the rest of the face would likely have caused irreparable damage), and all the rest is working out pretty well. However, all is not plain sailing. I have no idea how it happened, but somehow the head of the lion does not fit. Perhaps I managed to get the legionnaire’s head at just slightly the wrong angle, or I was meant to grind something down. It probably isn’t the cast or the sculpt – Pegaso pieces usually fit together excellently. Regardless, the join lines up beautifully on one side if you want the lion to be looking over to the legionnaire’s left (hard to the left, that is, like some sort of first century rapper who wears his lion’s head at a jaunty angle because he’s totally Via Appia), but does not line up at all if you want it looking straight ahead as it is in the box art. In the end, I was forced to sculpt to fill some pretty huge gaps. As you know, I detest sculpting. This move from painting sci-fi to historical brings me neatly to my next point, which is something I’ve been thinking about since Euro. At the competition, I met a whole tonne of new people, and it seemed that all of them wanted to ask this question. Normally, I’d say “I’m a technical writer, and it’s not very interesting”, but it was quite clear that they wanted to know what sort of things I painted. It’s a weird way to ask it, but whatever. What I feel many of them really wanted to know was where I fitted into the hobby: was I some sort of degenerate who only paints Napoleonics? One of those weird sci-fi nerds with no appreciation for history? Perhaps a closet neo-Nazi who paints US Civil War Confederates but really wants to paint Schutzstaffel? I’m reasonably sure my generally confused looks and mumbling about painting whatever grabs me got the point across that I’m not particularly allied with one topic or era, but I think it’s an interesting topic to discuss. We all pick the models we paint for a reason. I’m not going to begrudge someone for only painting Napoleonics, for instance – I may not really understand why you’d limit yourself, but I can appreciate that for some people there’s a real fascination with that part of history (and the uniforms are really something else). Equally, I don’t think someone who confines themselves to fantasy or sci-fi is doing the hobby a disservice: I’ve heard as many people talk about the incredible creativity of that part of the hobby as I have people muttering that the real world has all the horror and significance you could possibly want. For me, I sort of muddle around until I see a model that I can imagine painting. I might have a Good Idea – a setting to put it in, or a new colour scheme, perhaps a conversion or some way to drag it into a new context – or I might just really want to see how my version of a traditional paintjob stacks up against the box art (see Saladin). In some cases, I just really want to try painting yellow, or blue, or tartan, or the model has some historical significance to me (see the Otago Hussar). I should probably try to fit that explanation into about twenty words for the next time someone asks what I do. They’ll probably just want to know that I’m a technical writer.